• American Farmland Trust – Their mission is to save the land that sustains us by protecting America’s farm and ranch land, promoting environmentally sound farming practices and ensuring an economically sustainable future for farmers and ranchers. 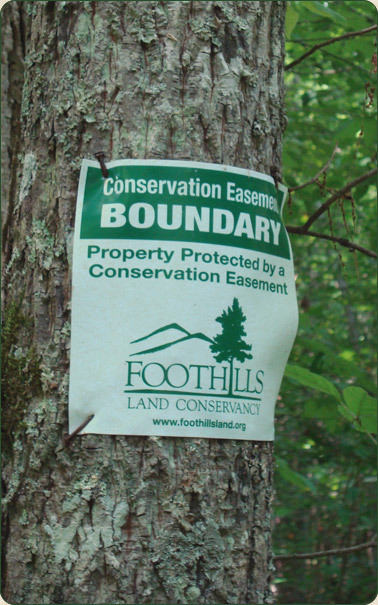 • Land Trust Alliance (LTA) – This LTA is the national service organization for land trusts and is an excellent resource for learning about the land trust movement on a national scale, including efforts to make tax benefits better for landowners who donate conservation easements. • Natural Resources Conservation Service (NRCS) – NRCS works with landowners through conservation planning and assistance designed to benefit the soil, water, air, plants, and animals that result in productive lands and healthy ecosystems. • The Nature Conservancy – The Nature Conservancy is the leading conservation organization working around the world to protect ecologically important lands and waters for nature and people. • The Trust for Public Land – The Trust for Public Land conserves land for people to enjoy as parks, gardens, and other natural places, ensuring livable communities for generations to come. Their focus is with city park creation, state and local conservation funding, and using GIS for conservation planning. • Tennessee Century Farms Program – The Tennessee Century Farms Program was created in 1975 by the Tennessee Department of Agriculture as part of our nation’s bicentennial celebration. In 1985, the Center for Historic Preservation at Middle Tennessee State University assumed the responsibility for the program. The program was originally designed and continues to be a recognition and documentary effort. First, it honors and recognizes the dedication and contributions of families who have owned and farmed the same land for at least 100 years. After 30 years, the statewide and ongoing program has 1,447 certified farms. Of that number 143 are 200 years old, 625 are 150 years old, and 679 are over 100 years old. • Tennessee Farmland Legacy – Formed in February of 2010 with the purpose to serve as an authoritative resource, to provide information and assistance, and to encourage both farm level and community planning that promotes the preservation and viability of working farms in Tennessee.